I've been told perfection is boring. Well, I'm certainly not boring (just ask my friends) and I'm definitely not perfect (just ask my kids)! Because of this I have a standing policy of rewarding people who nicely bring an error to my attention with a free single pattern download from my Ravelry pattern store. 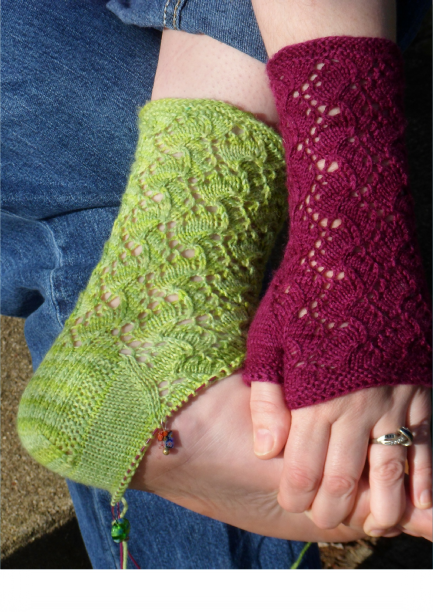 Promotions: pattern includes the Carpe Diem Socks, too! 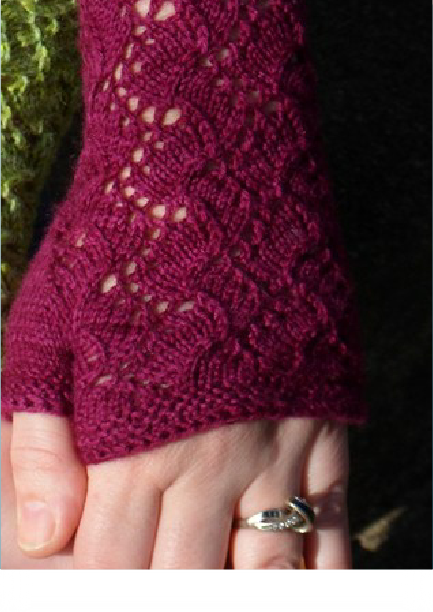 These charming fingerless mitts and socks make use of the Traveling Vine lace pattern. 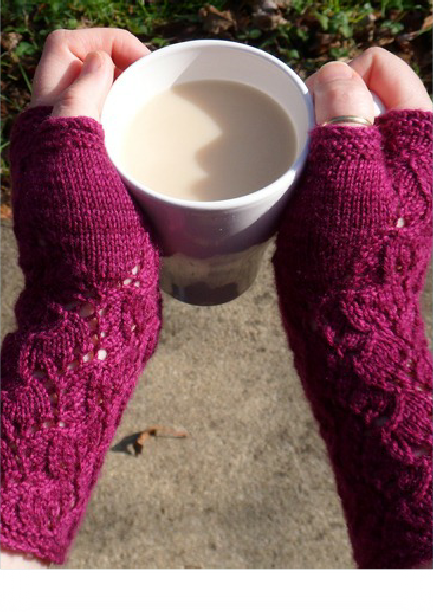 The mitts come in 2 sizes and feature garter stitch edges and a thumb gusset. The socks come in 4 sizes (with the smallest size suitable for children). While these patterns have a high “WOW” factor, care has been taken to keep them accessible to advanced beginners. While something is happening every round of the Traveling Vine pattern, because the lace is only ever worked in the round there are fewer types of stitches required than when worked in rows. Directions for the lace are provided in both written and charted formats. Other areas where the simpler route was taken were the thumb gusset (plain stockinette) and the heel turn (square—only 2 row repeat). Finally, the overall sock construction is standard (gusset and flat toe) but the heel flap garter stitch edges flanking standard heel stitch to add a bit of pizzazz for visual interest. New Releases Bags Ebooks For the Hands Free!! Garments Knit Picks Knitty Odds and Ends Scrap Happy Shawls and Scarves Socks Techniques Teaching Patterns EVERYTHING!